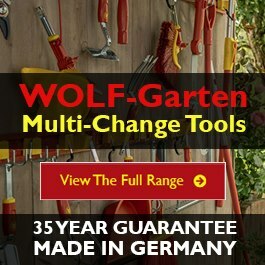 At World of Wolf we believe that the WOLF-Garten range of tools provide the complete solution for gardening. 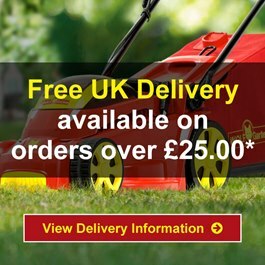 Whether it's lawn care you're after or soil and cultivation, trees and shrubs, general garden maintenance or growing vegetables to feed the family at your allotment. WOLF-Garten tools are the solution to caring for your outdoor space. The WOLF-Garten philosophy is to provide gardening tools and machinery of premium quality and performance that help make gardening easier and more enjoyable. All WOLF-Garten products undergo rigorous quality testing from the innovative multi-change® range to the electric lawnmower range, and every tool in the range is covered by a guarantee. It all began with minor inventions that put the WOLF-Garten company on the map. One of the first achievements was the draw hoe, a tool designed to make agricultural work easier. Gregor Wolf developed it in 1927 in the ironware factory that his father August Wolf had founded together with his sons Gregor and Otto in 1922. The idea first came to him on his way home from work, while observing local farmers working their fields. This initial innovation was followed by many others. In 1953 the WOLF Geräte GmbH was the first company in Europe to offer lawnmowers with rotating blades. In 1958 WOLF introduced the first electrical lawnmower to the European market prior to developing the world's most silent petrol lawnmower in 1975. Over the years, the company has developed a clear and distinctive profile in the "green area". The WOLF Geräte GmbH of the early era became WOLF-Garten, an established company known for their key skills regarding product quality, product diversity and gardening know-how with an expertise in environmental awareness. The focused research and development work in its own research institutes was just as important for their growth as the development of new market segments. Later global innovations helped give the brand the distinctive wolf face on a red background. WOLF-Garten is highly successful with its innovative multi-change ® system that has guaranteed top quality for more than 30 years and confidently provides a 10-year warranty for all associated products. The development of innovative seed and fertiliser products, as well as the extension of its lawnmower range have demonstrated the strength and diversity of the company. WOLF-Garten was one of the first companies to offer a wide range of versatile lawn tractors to the European market. Handheld all-season tools and special devices for winter use round off the WOLF-Garten range. WOLF-Garten promotes environmentally compatible technologies in times of climate change. The BluePower program, which extends through most product groups, clearly show the commitment of WOLF-Garten. Numerous quality awards and excellent results in comparative testings document why the trust of novice as well as professional gardeners throughout Europe is justified by the quality and innovative strength of WOLF-Garten. Making garden work easier, more enjoyable and more environmentally compatible will guide our corporate future like a green beacon.This goal is fully supported by our employees. It is them who ensure the familiar reliability, the high quality standard of the company and the inexhaustible innovative drive of WOLF-Garten.